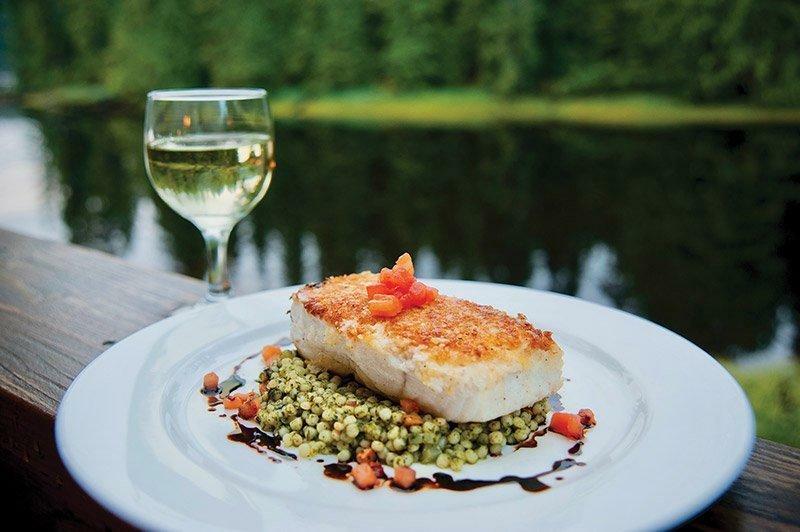 Given the limited number of guests at Alaska’s Boardwalk Lodge, our staff of classically trained culinary experts will make you feel as though you have your own personal chef. Like everything else you will experience while at the Boardwalk Lodge, our food and beverage offerings will delight your senses and enrich enjoyment of your Alaskan experience. In addition our attentive and friendly service staff is equally eager to please and aspires to provide for guests’ needs before they are expressed. Executive Chef Jeff Brady draws from a number of culinary styles and methods to create a wide range of delicious and attractive signature offerings that make use of local ingredients in season and elegantly reflect the rugged and aesthetic beauty of Southeast Alaska. Hearty and delicious breakfast selections are the key to a great start in the Alaskan wilderness. Enjoy pancakes and fresh breads and muffins – often prepared with locally grown, fresh-picked, wild berries. High protein selections include omelets, eggs cooked to order, and a wide selection of breakfast meats and sausages. Beverages include gourmet coffees and teas, hot chocolate, a selection of juices, milk and smoothies. How do you create a sumptuous, moveable feast for guests who are out on boats or sitting on the bank of a river? This is the question that Chef Jeff and his staff are continuously working to answer. They have developed a daily lunch buffet from which guests select a wide variety of nutritious and tasty snacks, sandwich items, drinks, fruit, and freshly baked homemade cookies to create a lunch meal that suits their own tastes and convenience preferences. As in all his offerings, Chef Jeff is constantly testing and trying new ideas and menu items that will result in pleasant surprises for his guests. The Hors d’oeuvres Reception is from 5:30 – 6:30 p.m. To prepare for this daily event, all of our boats and freshwater guides return to the lodge with their guests at 4 p.m. At that time, guests have a chance to freshen up from a long day of fishing or sightseeing while their guides and dock staff unload and prepare fish for freezing, and the culinary staff prepares a selection of hors d’oeuvres and beverages. At this reception, guests often are forced to make a choice between filling up on the delicious appetizers and saving room for dinner. We strongly advise saving room. This is the meal where our culinary staff really shines! Here their creativity and expertise show even more dramatically; and your Alaskan dining experience is raised to a whole new level. Chef Jeff creates the evening’s menu each morning. 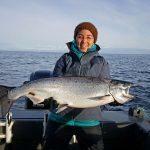 This allows for guest preferences, seasonally available ingredients and the fresh catch of the day to be utilized in creating a menu to fit the ever changing moods of Southeast Alaska. Often times, changes are made at the last minute to take advantage of these gifts from nature (or the chef’s fancy!). Your dinner experience begins with a tantalizing first course. Soup nights delight with a variety of soups, like our delicious Thorne Bay Clam Chowder, French Onion, Roasted Tomato Basi and Halibut Gazpacho. On alternate days, a simple and elegant salad course will be served such as Grilled Artichoke Hearts, Smoked Wild Salmon and Roasted Garlic Aioli; Summer salad with shaved Red Onion, Cucumbers and Gorgonzola crisps, Strawberry Vinaigrette and candied Walnuts; or Boardwalk’s famous House salad. Entrees include Alder Smoked Prime Rib, pan seared fresh Alaskan Coho Salmon, sesame crusted Alaskan Halibut, rosemary Chicken Breast, and citrus maple Glazed Pork Loin, with such accompaniments as fettuccini with a roasted red pepper cream sauce, sweet chili rice, creamy basil polenta, roasted garlicky cauliflower and summer vegetables. Finishers include Molten Chocolate Cake, New York Style Apricot swirl Cheesecake, Mango Panna Cotta, and triple Chocolate Brownie Sundays with a scoop of Huckleberry Ice Cream. Will you or a member of your group have a birthday or an anniversary or other special event while at the lodge? Let us know and then plan on great surprises for that person, compliments of Chef Jeff and his crew. We are also happy to accommodate special dietary needs with advance notice. During the day, boat coolers are stocked with your choice of soft drinks, bottled water and popular beer brands. Both wine and beer are also available free of charge throughout the evening. Our bar charges $7.50 each for mixed drinks ($14.00 for a double).